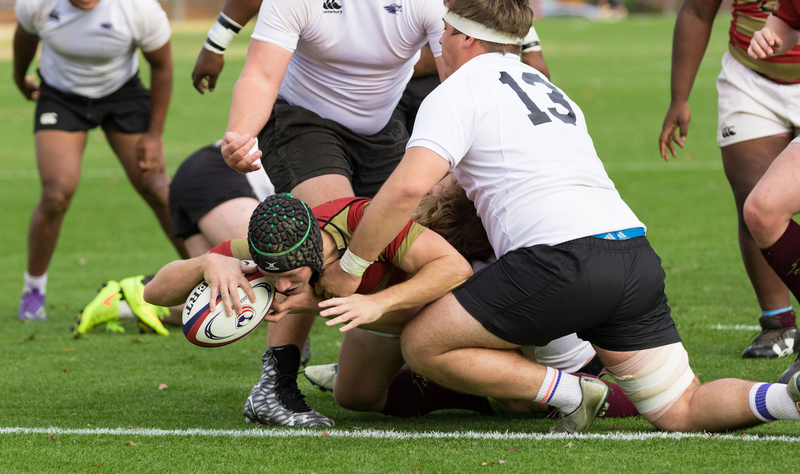 Norwich University scrumhalf Tom St. Pierre is the Goff Rugby Report Men’s DII MVP Back. Top, St. Pierre scores. Below. honorable mention Eric Pachowitz. Photos Jeremy Fleming. St. Pierre was voted by his players and coaches as the team’s best player of the game five times this season and he led the Cadets to an undefeated rugby in the NECRC. Norwich went on to beat Bentley and Rowan to make the final four. It was there the Cadets finally lost a game, getting upended by eventual champs Wisconsin-Whitewater, before beating Minnesota-Duluth for third. St. Pierre was superb throughout the playoff run, and even in the loss against Whitewater, the scrumhalf was a crucial factor, scoring two tries and helping make the other two Norwich tries happen. A special athlete and a special leader, who has been lauded by his Head Coach Bob Weggler as the glue that keeps the team together who has a keen understanding of the game. But more than that, St. Pierre gets the nod because he can change a game around, Playing in one of the most competitive conferences in DII rugby, and through a very difficult playoff run, Tom St. Pierre was the central leader, and someone who could create tries out of nothing. Tom St. Pierre is our Goff Rugby Report Men’s DII MVP among the backs.